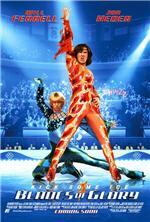 What did you think of Blades of Glory? It’s been a while since a comedy is made on an ice rink–Slap Shot anyone? But Blades of Glory is a comedy about figure skating and not hockey. Men’s figure skating. If you start to giggle while channel surfing and come across the men’s program of figure skating, this movie is for you. It’s pure comedy (crotch kicks and all), and the cast flows together seamlessly like a pair of skating partners. Going into this movie I was not excited. I’ve been let down by both Jon Heder and Will Ferrell before. But this is one film where you can count on the laughs to come. The plot set up is simple. Two ice skaters, Chazz Michael Michael (Ferrell) and Jimmy MacElroy (Heder), are stripped of their gold medals and permanently banned from men’s single competition for fighting on the podium after having to share the gold medal. In their fight, they accidentally set fire to the Stockholm mascot. Once banned, Jimmy’s adopted father (William Fichtner), who only adopts winners, disowns him and leaves him on the side of the road to find his own way in life as a loser. He makes his living working at a store selling ice skates. Chazz on the other hand, joins a children’s ice show where he performs as the evil wizard, and is drunk most of the time. Jimmy’s stalker Hector (Nick Swardson) finds Jimmy to point out a gap in the rules of the ice skating world about banning players, and Jimmy sets out to be a doubles competitor. Finding a partner in the two days before nationals sign ups, however, is hard. He runs into Chazz and they get into a fight that is caught on camera by a local news station. Their throwing each other around is seen by Jimmy’s old coach, aptly named Coach and played by Craig T. Nelson of “Coach” fame, who convinces Jimmy and Chazz to become skating partners so that they can compete again. The first male-male partnership ever. The reigning skating partners, the sister-brother team the Van Waldenbergs, are upset at the competition and ready to cheat to win. Amy Poehler and Will Arnett play the brother sister team with the sarcastic, witty comedy they show elsewhere. Jenna Fischer plays their little sister Katie, who does their bidding for them out of guilt until she falls in love with Jimmy that is. The Van Waldenberg family gives great balance to this movie. Without the evil team, the movie would have been flimsy and half as funny. You can imagine the rest of the movie. Awkward skating holds, tough man competitions on the ice, crotch kicks. It’s slap-stick comedy with a predictable plot, but still funny. The final chasing scene by Arnett and Farrell is reason enough to see this movie. That is if laughing hysterically wasn’t reason enough.